Please note that Annual OLLI membership ($60 per year) is required to register for these courses. We welcome all - please click on "Join / Renew" above to become a member of OLLI at BCC. If you wish to add or delete class registrations after having previously "confirmed" your choices, please call the OLLI office at 413 236 2190. OLLI's Winter 2019 semester of classes runs from January 15 to March 1, with 14 weekly classes held at various locations in Pittsfield, Great Barrington, and Williamstown. Courses range from 5 to 6 sessions each. To register for classes, you need to first join OLLI, if you are not already a member. You can then register online, by mailing in the registration form found here, or by phone at 413.236.2190. 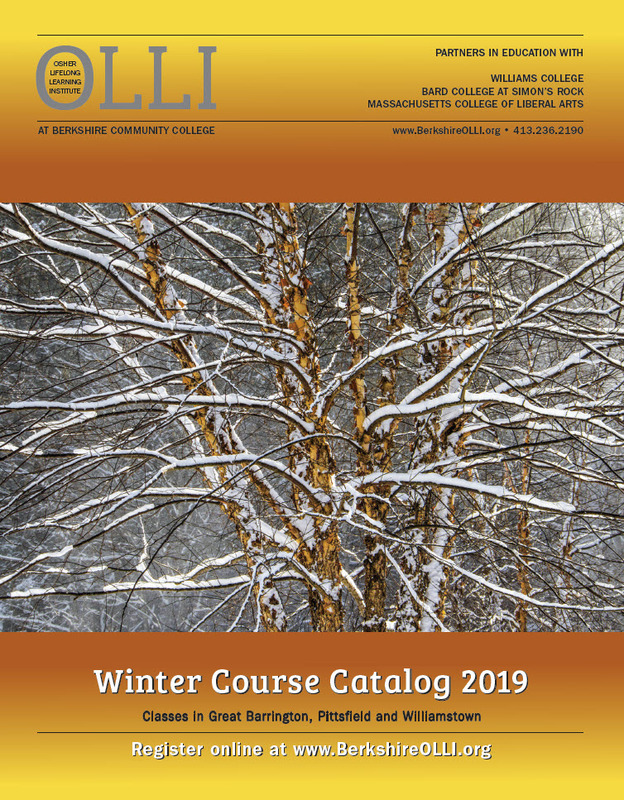 To view the complete winter 2019 course line up and find links to individual course descriptions click here: Winter 2019 Class Schedule, or peruse the catalog online by clicking here. Questions? You can always give the OLLI office a call at 413.236.2190 and we will be happy to help!